I am beginning to believe there is an inherent conflict between church and Gospel. Most of us who belong to or who participate in a church describe it as a community. We know who is there. It is comforting and supportive and encouraging, and sometimes even challenging. But even when it is challenging we find a sense of stability there. Because of that, even with all of the outreach, mission, social justice efforts in which congregations are involved, churches basically face inward. We are there because we like and care for the others who are there, and we are there because of what it adds to our own lives. On the other hand Gospel – the good news about which Jesus spoke – is a bit rough around the edges. It was then and it is now. Gospel is primarily concerned with those on the edges. Those on the outside and not the inside. And, it is about the Dream of God which envisions where they live and where we live becoming overlapping circles. And, that I think is uncomfortable. Many in our culture, especially those who are younger than I am, don’t understand church because they stand on the outside looking in. We might tell them about all we do and why our community is important, but never having been on the inside they don’t get what we are trying to say. But, while church does not interest them, I wonder if they are looking for, even longing for Gospel. Looking at the world in which they live and longing for something more. Looking at their lives and seeking something deeper. Something that may look and be very different than the church I have known. Tomorrow afternoon a young man who I have known most of his life and who is a member of the congregation where I am pastor, is appearing before a gathering of church leaders as the next step in the process towards his becoming an ordained Presbyterian pastor. I am excited for him. And I know it is an important and meaningful step for him and for his parents. And, while I will participate in the official part of the ceremony marking this next step in his journey, I wonder about the “church” he is preparing to serve and to lead. The only thing I know for sure is it will be very different from the church in which he grew up and even more different from the church in which I grew up. He and I have talked about that challenge and about what the future might hold. Yet, here is what I find disconcerting and a bit unsettling. Much of what will happen tomorrow will be in the framework of “church” which is rapidly fading away. We will use language and processes and expect a certain type of language in return which means something at least to some of us who will be present, but which means almost nothing to those with whom this young man will work and share his understanding of that which we know and name as God. While he will be surrounded by the support and encouragement and prayers of many, I wish we had the courage and the creativity to do more. This article has shown up in my Facebook newsfeed several times over the last couple of days often commented on by other church folk I know. The article speaks about the reasons young adults are leaving the church (or just not coming in the first place). What the author names and what others have documented is that young adults perceive the church to be too political, too judgmental, too exclusive and too unconcerned about the pressing needs facing families, communities, our country and our world. All of us who are invested in the church need to hear and take to heart the critique of who we are or, at least, how we are perceived. But mostly, reading the article just made me sad…for several reasons. First, while all of us are guilty as charged to one degree or another, I think there are many, many congregations that have worked hard and are working hard at being inclusive and taking stands for justice and doing the hard work of addressing the community issues that land on their doorsteps. And, many, many congregations have made room for questions and opened their doors to the LGBT community and cringe when they hear, over and over again, God bless America when it is said in such a way as to imply that God cares more about us than anyone else. I am sad that public perception is such that it paints everyone with the same narrow minded brush and lumps all of us into one small way of thinking and being. And, I am sad that those of us who have been working on the issues that young adults say are important have been so inept at connecting the values and the language of our faith to the issues we face. I think we have relied too much on insisting people come to us on our terms rather than our meeting them where they are and helping them to make the connections which they seem to looking for from a faith community. We are left playing catch up, but often playing it blind folded with little or no sense of what direction we might go. 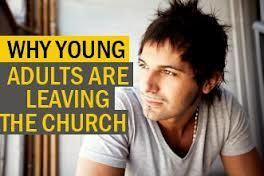 And while I value the sincerity and honesty of the article, I am sad because the data seems to indicate that several generations of young adults have walked out of the church and into a vacuum. Yes, I know that I, and others like me, need to step beyond what we know and what feels comfortable to us, and that we need to be the ones to take the first step. But when I do or we do I/we need (wrong word?) others who are willing to step towards me so we can figure out what comes next together. Maybe the article is another step in that direction. And others like me reading it and thinking about, yet another. About a month ago in the New York Times, David Brooks, the political commentator and Op-ed columnist, wrote about two studies on word usage that have been done using Google’s new database of 5.2 million books published between 1500 and 2008. The first study showed that in the last 50 years words and phrases like self and unique and I come first and I can do it myself have increased in usage. And, words and phrases like share, and united, and common good have decreased in usage. The second study focused on words associated with what the authors of the study categorized as morality and virtue. That study found that words like honesty, and decency and compassion are being used less today than they have been used in the past. The use of words like thankfulness and appreciation has decreased by 49% in the last 50 years, and words like kindness and helpfulness has fallen by 56%. Not knowing anything more about the studies than what I read in David Brook’s column, the trend indicated by the words we use today compared to the words we used 50 years ago seem to match the trends I, and many others, see and experience in culture around us. It seems to me there is less common ground than before. And, less interest in the common good. And, more focus on me and mine and what I want and what’s in it for me. Sharing and gratitude and enough for all. Is the shift identified by the studies and the tension it creates just chance? Or, the particular whim of writers and authors? Or is all this only an interesting academic study that doesn’t mean very much in the world you and I inhabit each day? Or, is it a snapshot of something more? Something that is happening around us and to us? And maybe happening in such a subtle we often fail to notice? And to thinking about who we are. And to why we are here. And to what we value. And why it may be important we gather as we do. And, it also brings me, to these questions. And, the language we use shapes and/or reflects the reality around us, what words, along with the message and meaning they carry and the implication they have for your life, are important to you? What words do you want your children and grandchildren to grow up hearing? Does it matter or make a difference that in the push and pull of life as it is, at least once a week you have the opportunity to hear words and to be reminded of values like compassion and kindness and community and gratitude? Does it make a difference that our children grow up with regular reminders of sharing in order to help others and of treating others the way they would like to be treated? I happen to think it does. Yesterday, I was in Philadelphia officiating at the wedding of our son’s college roommate. During the service I reminded the couple to say I love you to each other at least once a day. I encouraged them to say those words to each not only when they felt very much in love, but also to say them when it was hard to speak the words. Because it is in those moments, when it is difficult, that not only the other person needs to hear them, but they and we need to hear ourselves say them and so be reminded of the commitment we have made and the love we share. And, loving God, and your neighbor as yourself. And your being and our being the light of the world. And, about seeking justice and loving kindness and walking with God. The church I grew up in was heavy on what we were to believe. God as Father and Jesus as God’s only son. The virgin birth and Jesus dying for my sins. For many people, maybe most people, that doesn’t work anymore…at least in the way it once did. Lately I have been thinking more and more about the church as a place to practice. A place where we can practice meeting and caring for our neighbors. A place to practice praying and to practice caring for ourselves. A place to practice grappling with complicated issues without just pointing figures or blaming another. A place to practice compassion and where we can learn what that means and how it feels and how it fits into our lives. A place to practice being grateful. We listen to and use language that reminds us of the deepest and best values inherent to our faith. Values that are important to be reminded of again and again and again because they are not always easy to hold onto in the world out there. That kind of church makes sense to me. Here is some of what I have been thinking about recently. I am pretty sure Christianity is not the only way to understand/experience that which we know and name as God. And…I don’t know enough about most of the other ways people understand/experience God to say that my way is the best way or a better way. All I can say is it is my way. And, I think those of us who are Christians worry far too much about Christianity and the future of what we call the church. Jesus never worried about what we seem so preoccupied about. Jesus never intended to launch a new religion. He never intended to create a new institution. He worried about the people around him and how they were treated and how they treated others. He worried about rules that got in the way of compassion. He worried about those who were so busy or preoccupied that they passed by those in need. He worried that religious leaders had tricked people into believing that God was locked in a temple and only placated by rituals instead of God being present and experienced in the midst and muddle of daily life. He told people to treat others as they would like to be treated. He redefined neighbor to include those who were, too often, considered one of them rather than one of us. He did what he could to heal and to help and to create hope and told us to do the same. That, it seems to me, is what we should be worrying about…if we can live that way and can encourage others to do the same. And, not to spend our time worrying whether or not they are Christian like I am Christian or even whether they are Christian at all. Maybe what Jesus was trying to do was to make us more human. And to show us ways to be more humane towards each other. If I am even close to being right, then we might do well to follow his example.